A hunt before they unfurl. Last year, I started writing a memoir and completed the first section, which is titled “Fiddlehead Season.” There’s something about the fleeting nature of this part of spring that reminds me of childhood, both my own and generally. Below is a condensed version of a small section of my memoir with an update from last weekend tacked on the end. The father of a childhood friend has a hobby of foraging and had become somewhat famous locally because of this. He was very successful in fiddlehead season, so much so that it truly amazed me after I had moved back home and started foraging for fiddleheads myself. He was also the only person I personally knew who is an avid mushroom forager. I have always hated mushrooms, so this skill was something I had never learned to appreciate. One spring after my husband and I moved back to my home town, I got a phone call out of the blue. My friend’s dad announced himself then said: “Sharon, let your mom know that I have a bunch of fiddleheads for her. You can come by the house any time.” Click. The next morning, my mom and I headed over there. We weren’t even sure which house it was, despite the many times I had gone over there as a child. It’s funny how, over time, you can lose faith in your memory. Is it the white one next to the brick house or the other one in front of that? Luckily, we were saved by the lady of the house, who popped out of their front door when she saw our slowing car. We met her at the open doorway, through which she handed us some Ziploc bags and told us to head out back to take as many fiddleheads as we wanted. We found them soaking in water in a large white bucket in the shade, under the eaves of their house. I’ve received similar calls most springs since then, and sometimes I’d even go by the house myself and just help myself to fiddleheads from the bucket in the back. It had become an early spring routine. But the calls stopped two years ago and I learned that my friend’s father’s health had begun to fail and he was no longer able to forage. Last summer, I had arranged for some of my friends from out of town, who have a keen interest in Vermont mushrooms, to meet and discuss mushroom foraging with my friend’s father. He had diligently prepared by assembling several photographs of different local mushrooms he himself had taken through the years. He had also marked up several reference books with notes and tabs. Although my companions already seemed to know quite a bit about the edible mushrooms in the area, I could tell they were gleaning helpful tidbits and were thrilled with all of the preparations and visual aids. I wasn’t really participating in the conversation, except by picking up a photo here and there, nodding, and asking a few tangentially related questions. My mind wandered to other things and then, finally, to fiddleheads. As they kept talking about puffballs, chanterelles, and whatever else, I decided that I wasn’t going to leave that house without knowing that secret spot where he successfully forages for all of those fabulous fiddleheads every spring. Last weekend, my husband, Bruce, dropped me off at the bridge at the end of the road. I got out of the car with my baseball cap, my iPhone, and two pairs of scissors stuffed into our spaghetti strainer, which was set inside our green plastic vegetable strainer. I carried these items in my right hand and used my left to move sticks and trees and bushes out of my path. I went directly to the river bank and it wasn’t easy going. Young green shoots were all over the place, mostly covered with dead twigs and long, brown grass that had become matted against the ground over the long, snowy winter. I went toward one patch of green and then another and another, ruling them all out. Then I made my way methodically south, staying about the same distance from the edge of the river. After moving a ways downstream, I noticed some unfurled fiddleheads to my left, the side that was away from the river. I hadn’t expected this. I was told the ferns were on the riverbank. No matter, at least I found them. At first, I was disappointed to see the tall, thin fiddleheads already unwound, reaching toward the sun, because I thought I was too late. After all, I was told “May 1st.” However, the winter had been long, and when I looked in my usual spots the previous weekend I could see that it was still too early to pick them. The truth is, they come and go so fast you can’t always plan to harvest them over a weekend. I knew that. I should have come during the work week. 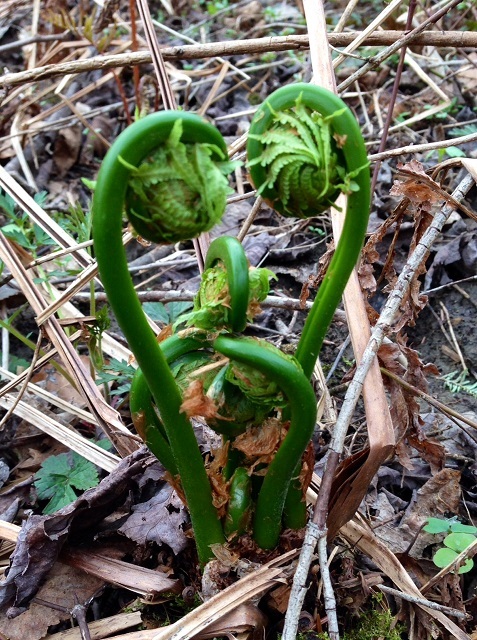 I was berating myself with these thoughts when I saw a large tight mound of perfect, tightly furled fiddleheads. They were large, and a deep, dark green, reminiscent of the ones I bought at a local market last spring. After I cut them, I spotted several others just like them nearby. They were there all along. I just couldn’t see them when I was distracted by the unfurled ones. 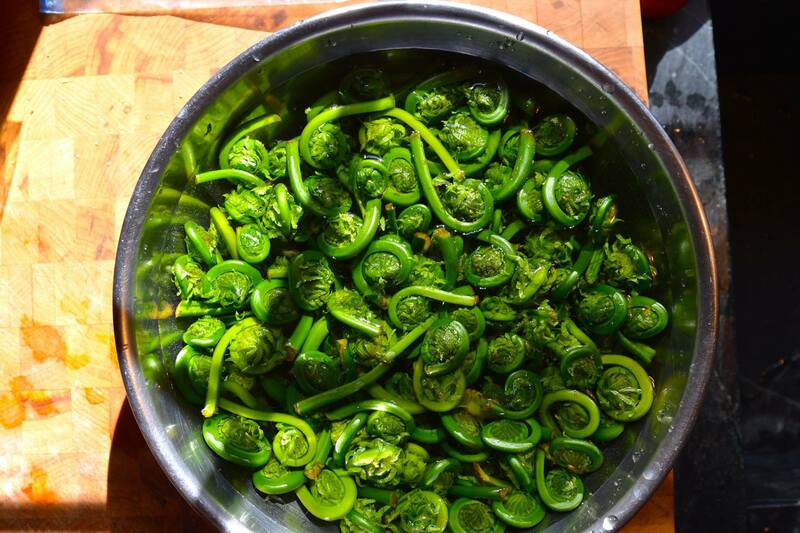 If you ever plan to be in northern New England in early May and have an interest in picking fiddleheads, check out my “how to” guide on Facebook. Missing Western MA and all it’s offerings. Next up “Hadley Grass” aka Wild Asparagus. You sure did. Both with the picking and with the blog editing! My father also had a secret spot, and often came home with fiddleheads. Personally, I prefer asparagus. Hi Sharon.. Fun story.. how did you prepare them? I have seen recipes saying to saute them in garlic and oil… what is your favorite recipe for them? However, if you boil them or blanche them in a saute pan, you can freeze them and really use in any recipe that calls for asparagus.